This transitional style furniture piece is perfect to create a classy statement in your bedroom. Made up of wood veneer and solid wood, this dresser consists seven storage drawers with engraved flower pattern on the front. Enough spacing of drawers will allow you to easily place your commodities. With a dark oak brown tone, this dresser features round tapered feet and felt lined top drawer for delicate storage. Bring this furniture piece to give bedroom an instant makeover. Made up of sturdy solid wood and wood veneer with dark oak brown finish. 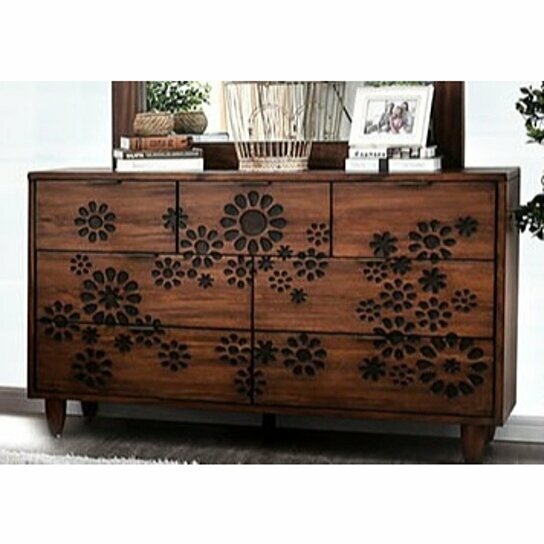 It features engraved burned wood flower design and felt-lined top drawers.